Can the Wild Horse Fire Brigade really work? 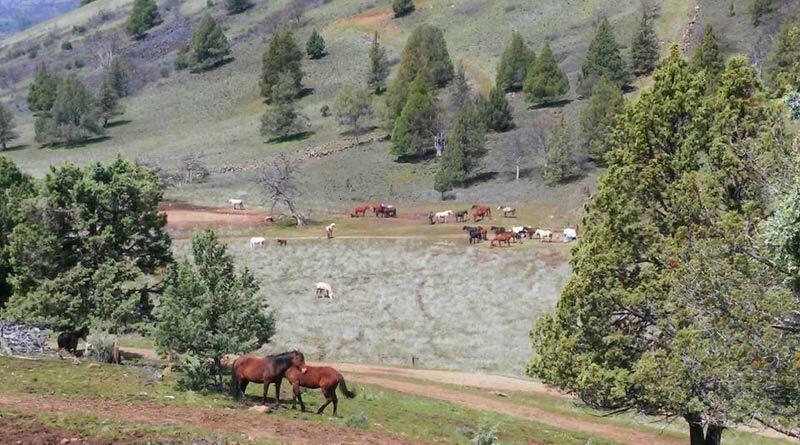 Native Kiger horses grazing in the Cascade-Siskiyou National Forest. In the above photo provided to me by the Assistant Director of the Cascade-Siskiyou National Monument (Mr Joel Brumm), a small family of native wild horses is shown in the Monument abating grasses and brush near a stand of large conifers. The Cascade-Siskiyou National Forest (and Monument) is a rugged mountainous area near the Oregon-California border, at an altitude of about 5000 feet with much steeper mountainous terrain all around, that is easily traversed by wild horses and cervids (deer and elk). Unlike cattle, the anatomy of wild horses has evolved so they are ideally adapted to traversing even the most difficult terrain. Here on our ranch, the wild horses regularly graze steep rocky cliffs, sometimes grazing higher on the steep rocky mountain sides than the few remaining deer, which in this area is stricken by over-depredation by lions, wolves and coyotes, and quite likely by chronic wasting disease (‘CWD’). In fact, the area is well-known for its excessive numbers of large predators, including coyote-wolf hybrids, wolves, bears and mountain lions, which makes grazing domestic livestock in this area a financial loser. Even our small local herd of wild horses has suffered a significant net drop of ten animals in its population over the past four years during that period (10 of 67 animals lost). Even adult horses are regularly preyed upon by lions (contrary to what some co-called experts claim), while the foals are killed by coyotes (these facts are documented with reports and photos). The evidence that horses co-evolved on the North American continent with cervids and bison for hundreds of thousands of years is incontrovertible, and is well-supported by fossil records in North America, archeological records (ancient petroglyphs and pictographs by American Natives) and now also by molecular biology and DNA studies, which compares the DNA from the wild horses found frozen with woolly mammoths in North America to the wild horses found in America today; they are genetically the same species, a native species. Like many other pristine forest areas, the Cascade-Siskiyou National Forest and Monument is not suited to mechanized fuel abatement or logging, and man-powered abatement is far too expensive! However, as with deer and elk, wild horses can abate the prodigious amounts of grass and brush that cover these forests areas, and do so without any adverse impact. In the above video, we can plainly see how wild horses browse off dry grasses and brush effectively and without any adverse affects. For this exact reason, draft horses were used successfully for logging in fragile forest environments for many centuries. And that environmentally sound horse-logging methodology continues today in Southern Oregon by people who understand the truth about horses in the forests. Unlike livestock, these horses are immune to prion disease (chronic wasting disease ‘CWD’ in deer/elk & BSE ‘mad-cow’ in cattle). Wild horses also take some of the predator pressure off the cervids in the forests, where cattle would be attacked regularly (killing profits) and which are not immune to prion disease. Just seeing the photo at the top of the page should be a wake-up call to forest managers everywhere as to the huge fire prevention benefits of re-introducing this native species (wild horses) back into our forests (where by the way, the fossils of their ancestors lay in the ground). Wild horses are a native species to North America and resource managers need to drop the false ‘invasive species’ line, which was spawned by the cattle industry as a narrative to color dialog with legislators in their negotiations with legislators and officials in their attempts to gain more grazing permits on public lands. The truly sad thing is this is just a very isolated instance of wild horses living symbiotically with forests and protecting our valuable forest ecosystems as they had on the North American continent for millennia prior to the arrival of the Vikings or the Spaniards. As the photo at the top of the page clearly shows, thanks to this family of native wild horses, there is a nice fire break now formed between a stand of trees! Additionally some of the fuels under these trees are also abated. Some people might ask about the food supplies for deer and elk. What they fail to realize or understand is that wild horses co-existed with deer, elk, moose and bison on the North American continent for hundreds of thousands of years, and there was no shortage of food then. The herds of cervids (deer, elk and moose) were astoundingly large, numbering in the hundreds of millions of animals. Today, there are 98.4 million cattle grazing in America and there are fewer than 100,000 wild horses remaining, with about half of those wild horses in BLM corrals. The stallions that are part of the corralled wild horses have been gelded, ending those genetic lines forever, without having any idea as to which genetic lines have been ended. This is extreme management folly and transitions the line into recklessness, given that we have no idea what alleles or percentages of alleles even exist in that small (endangered?) genetic population. However, now due to acutely depleted herbivore populations in west coast forests and especially in California, many (tens of thousands) more wild horses are needed to make-up of the difference to control excessive grasses and brush (California had two million deer in 1970, today there are about 350,000 left). In Siskiyou County alone, in 2015, our managers failed and about 500,000 acres of pristine forests burned to the dirt! Now what do they manage? Earth worms? In 2015, more than ten million acres of west coast forests in America burned to the dirt. And after that summer fire season finally ended, after burning for months, the rains came and washed thousands of tons of dirt ash into the once crystal-clear trout and salmon streams, covering all the fish eggs from the recent spawning season and suffocating the eggs. So much for any return of salmon and steelhead. The damage done to our watersheds by small-minded managers is mind-blowing. In addition to the many forms of recreation that can be enjoyed in our forests, if they don’t become extinct, there is potential for significant revenue from the same forests if properly managed, and if forests can be protected from catastrophic wildfires, and if we can stimulate some action from the House Committee on Natural Resources with your voiced insistence via our legislators. Even our county officials need a good jolt of reality and should be contacted and expected to also write to legislators. Of course if it all BURNS to the dirt, we are done for decades … which is why the unique WHFB plan is so important. If saving lives, forests, watersheds, private property, animals and money (taxes) is worthy of completing a pilot-study based on the mutualism between horses and trees, we should immediately push for a legislative dialog on this concept. And in order to complete this study (with statistically relevant numbers), we will require all of the horses that are in BLM holding at this time (about 50,000). Sec. Zinke has control over the 50,000 horses in a corral, which some people say he intends to kill because he can’t afford to feed them ($50m/yr costs). Given the foregoing facts and information, I think those wild horses are the answer to a prayer in saving our trees from fire for recreation, lumber and jobs. The horses that Department of the Interior Sec. Zinke is considering killing can, in almost any terrain, abate (fuel for fires) grasses and brush at the rate of 1.2-Millions pounds per day. You can read more about this concept here, and here. Everywhere in the world wherever a species of large herbivore has its population depleted or eliminated, vegetative (fuels for fires) materials (grasses and brush) become excessive, resulting in a scenario where catastrophic wildfires take over. The science is crystal clear and incontrovertible on this point. And that very thing has happened in many of the forest lands of America, including but not limited to Siskiyou, Humbolt, Shasta and Trinity Counties. It’s no coincidence that here in the western United States where wildfires are turning forests into ash year after year, we have depleted herbivore populations. And in other locations, deer and elk are virtually non-existent. Let’s band together now and save our remaining resources so they can be used wisely to benefit mankind and nature. There is a middle-ground where we can all agree … and if that’s not the case, we are doomed as a society. This is a great idea. Makes lots of sense. Hopin all are for it !! Thanks for the great idea .